The market analysts who have been overwhelming bearish on Gold (many holding Shorts) are now in the position of potentially needing to play catch up, which would chase the market higher. 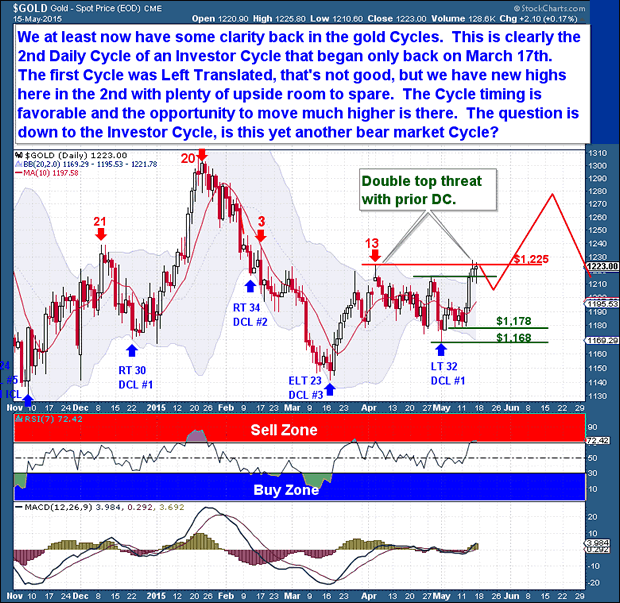 We'll be eagerly watching for upside confirmation, but for now, we'll be content with finally gaining clarity on Gold's Cycles. With a comfortable Cycle count, we can construct a new framework of expectations. We know now that the current Daily Cycle is the 2nd of the Investor Cycle that began on March 17th. The first Daily Cycle was Left Translated - I'm not thrilled with that - but we have reached new highs in the 2nd DC, and there is plenty of room to the upside. As a preview of a later section, the Investor Cycle shows that Gold has room to move higher, even if it remains in a down-trending bear market Cycle. So with favorable Cycle timing, I expect Gold to have at least one more decent rally before again confront the question of where Gold is headed. It should come when Gold reaches the intermediate term downtrend line that dates back to early 2014. The Junior Miners are looking great. I've studied Gold long enough to know that a healthy market for Junior Miners is always a bullish sign. 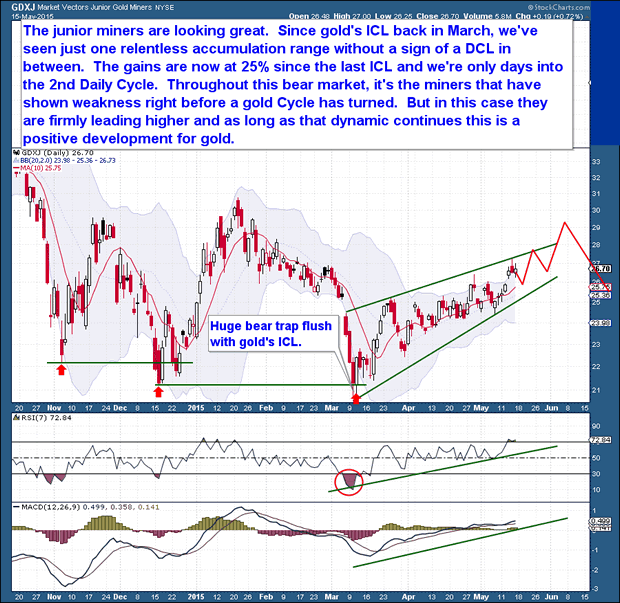 Since Gold's Investor Cycle Low (ICL) in March, there's been a seemingly relentless accumulation of the Miners, and without a typical DCL decline. This is fairly uncommon for the Miners as they are high beta in relation to Gold, so a sell-off in the precious metals complex typically hits them much harder than Gold. This behavior speaks to the potential accumulative bid under the Miners. Although it's too early for grandiose claims, relative strength in the Miners is consistent with buying near a bear market low. In fact, the Miners have already gained 25% since the last ICL Gains like this are not unusual for an IC, but in this case, we're only days into the 2nd Daily Cycle. In relation to Gold, the Miners have been especially impressive. Throughout the bear market, the Miners have led Gold, and have typically shown weakness right before a Gold Cycle turned down. In today's case, the Miners are firmly leading Gold and the sector higher. 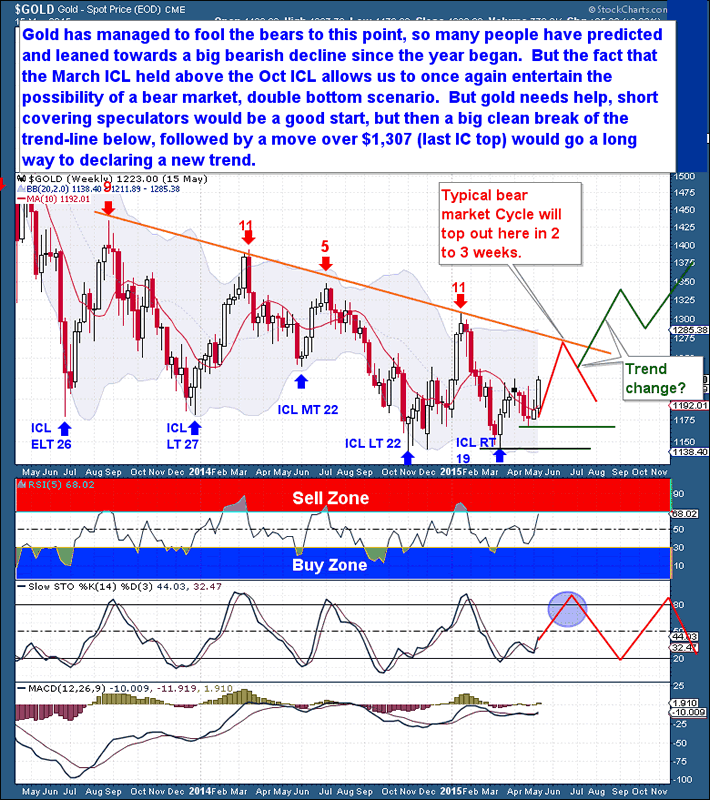 As long as that dynamic continues, it is positive for Gold. The same can be said for sentiment; the COT report is bullish for Gold. No one has given Gold any chance of mounting a real rally, and 9 weeks into the Investor Cycle, short speculative positions are at levels near those typical for an ICL. From the below chart, we see that Gold is still locked in a bear market trend, as marked by 5 long Investor Cycles. In looking at traders' positions and the ebb & flow between being Short and being Long, the current Cycle is nowhere near a typical topping point. 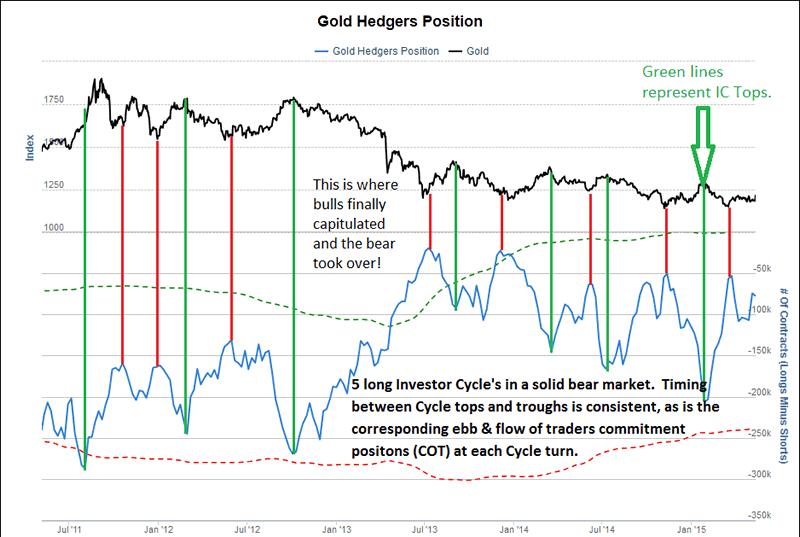 The timing between Cycle tops and troughs is fairly consistent, and the chart shows that Gold still needs a Short-covering rally before an IC top. This has been the behavior of the current bear market: Short-covering drives a final rally that fizzles once the Shorts have been exhausted. If the bear market is over, once the Short-covering rally ends, Gold will transition into an organic rally based on wholesale speculative buying. This organic buying will be from traders who prefer to risk capital in Gold rather than other bullish assets. It's a stretch to be even considering that possibility at this point, but it is worth mentioning as an illustration of the difference between buyers in bull and bear markets. Since the beginning of 2015, there have been widespread calls for much lower Gold prices, with $1,000 and even $725 as popular targets. Gold's current upside move has proceeded under the radar, and has managed to fool these bears so far. In the process, the Gold market is presenting my favorite type of rally, one where there is fuel remaining in the market to support a much greater move. The COT report underscores this idea. Traders are still Short the Gold market while Gold sits at a 3 month high and on the verge of further upside that will force traders to begin covering their Shorts. Longer term, remember that the March ICL held above the October ICL. With our newfound Cycle clarity, we no longer need to be concerned with the possibility of an early IC failure, so we can once again at least entertain the possibility that the bear market double bottomed in March. I believe that we're about to see a Short covering rally from the speculators, one that will drive price up to the declining trend-line that marks the place where the last 5 bear market ICs topped. Beyond that, further upside will require that speculators turn bullish and begin buying Long positions again. If that unfolds, we should expect to see Gold cleanly break and exceed the trend-line, and eventually push into the $1,300+ range, perhaps as high as $1,375. And if that happens, Gold will be in a new up-trend because of the double bottom ICL followed by a higher Investor Cycle top. It would be an exciting development for long-suffering bulls! The Financial Tap publishes two member reports per week, a weekly premium report and a midweek market update report. The reports cover the movements and trading opportunities of the Gold, S&P, Oil, $USD, US Bond's, and Natural Gas Cycles. Along with these reports, members enjoy access to two different portfolios and trade alerts. Both portfolios trade on varying time-frames (from days, weeks, to months), there is a portfolio to suit all member preferences.